The poignant tale of the Outcast is a stark reminder that no one people in the pocket universe of New Eden are without sin or blame. Even the Minmatar, beleaguered underdogs of the four great nations and subjects of many a Gallente charity drive or human rights protest, have their own shameful taint, which they above all are reluctant to admit or acknowledge. Still deeply rooted in tribal folklore and steeped in tradition, the Minmatar often attract scorn for the seemingly barbaric rituals they cling on to; the Voluval, that most integral of ceremonies, chief among them. While it is clearly the most influential and important ritual to a young Matari, it carries with it a terrible burden often swept under the carpet by shamans and spokesmen of the tribal faith. After all, if the fact that those who would fight most fiercely for freedom, would also readily oppress a fragment of their own populace, became known to the public at large – it would surely cut the legs out from under any lucrative charity effort. The broken shield, the pale eye, the Slaver’s fang. These dread markings, while thankfully rare, are an inevitable by-product of the unpredictable genetic lottery involved in the marking ritual. Some force a Voluval subject into a self-imposed lifetime vow of silence under the penalty of having his tongue cut out by his kin should he or she ever break it – others, like the dreaded pale eye, condemn the unfortunate young tribesman to exile, though exile is usually the path chosen by those cursed by a foul tattoo regardless of the penalty it carries. What precisely happens to these tormented children of rage is known by few, and spoken of by fewer – even the liberal Gallenteans, always eager for a good cause to leap upon like lampreys and saturate their media with, have never heard of Vo’shun. Vo’shun, or ‘Hidden Hope’, lies on the devastated homeworld of the extinct Starkmanir tribe, once called Starkman Prime but now largely forgotten. 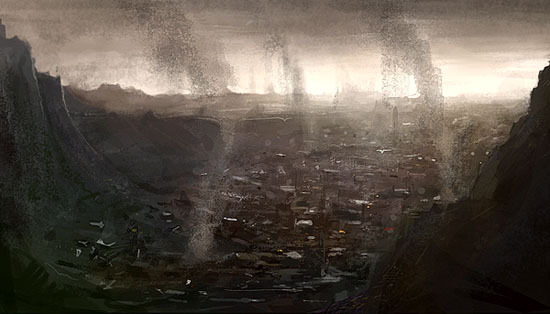 It is a sprawling complex of rust and girder, a veritable shanty-town of interconnected, self-contained habitat modules built in a man-made geological feature known as Sorrow’s Gash – man-made, because four hundred years prior, an Amarr orbital bombardment fleet gored this hundred mile canyon in the face of Starkman Prime’s largest continent with their ravening tachyon siege lasers. There, among smouldering sulphur volcanoes, surfing a fractured tectonic plate, dwells the only sanctuary the Outcast can call home. There is but one law in Vo’shun: no one is turned away. Ruled entirely by tribal law adapted and modified from Minmatar folklore, the colony is a mishmash of utter savagery and social enlightenment the Republic quietly envies. Murder is more than common, suicide is rampant, but above all the people of Vo’shun know freedom. Those stained with the Slaver’s fang can sing war songs rather than be condemned to a lifetime of silence; those marked with the pale eye can live among kin. The Sisters of Eve attempt regular clandestine aid shipments to Hidden Hope, which exists in a state of near-poverty. Due to Starkman Prime’s location in the Arzad system – a disputed border zone between the Minmatar and the Amarr – many of these shipments are interdicted, which in turn forces the Outcast to turn to piracy. While the Amarr Navy is brutally efficient at curbing Outcast raids, the only reasons the Empire has not allowed slave raiders to invade Vo’shun, is an eagerly perpetuated and not altogether false rumour that the colony is rife with communicable diseases that render its populace unsuitable for enslavement – and, unbeknownst to the bedraggled citizens of Hidden Hope, a curious edict put into law by Idonis Ardishapur himself, whose royal family has domain over Starkman Prime. Enacted shortly after Ardishapur scouts stumbled upon Vo’shun a mere decade ago, the edict, not widely publicized or even understood by imperial lawyers – yet tacitly enforced nonetheless – states unconditionally that no further harm shall directly befall this shattered world. This edict’s name: Khadrea’s Law.